Out of all the Silver Screen look-alikes I have made yet, none have been as rewarding to see finished, as fun to wear, or as tiresome to make as my newest Hollywood imitation: a dress from the movie “The Artist”. 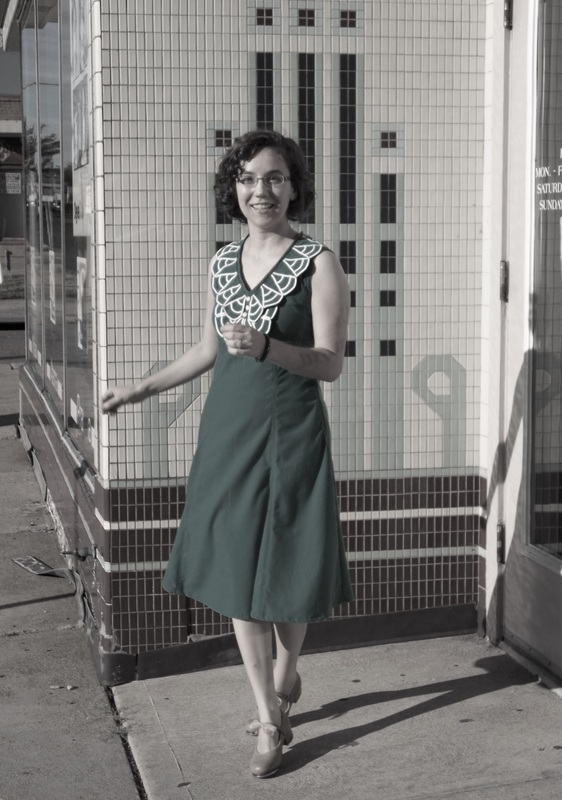 This dress is also one my best fitting creations, amongst my modern and vintage sewing alike. I simply can’t help but break out and dance like Peppy in this dress, especially since I now have a good excuse to wear my tap shoes! Peppy Miller, played by the actress Berenice Bejo, is the one of the main characters in the 2012 movie “The Artist”. It is a silent (music only) film in black and white. 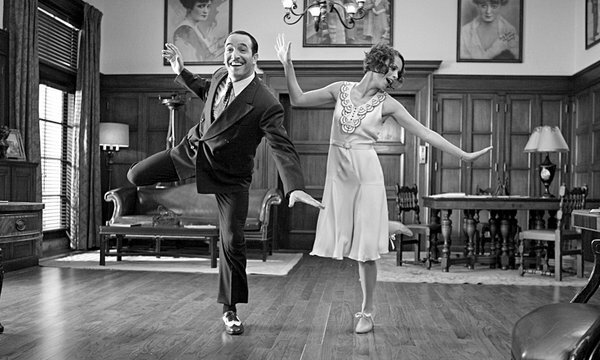 The movie spans the years of 1927 to 1931, and, as IMDb sums it up, “The Artist” is about how “a silent movie star meets a young dancer, but the arrival of talking pictures sends their careers in opposite directions”. My dress, which I carefully copied in many details, is seen in a tap dance scene towards the end of the movie, thus it might be more of a 1931/1932 era outfit. For being a rather small production film coming from an independent/private company, “The Artist” won 5 Oscars and numerous other awards, especially the Academy Award for Best Costume Design. Peppy sure is a natural when dancing with George Valentin ( played by Jean Dujardin) and together they make me smile as well as desire to learn some of their tap moves! Here’s a original shot from the movie to show you where my inspiration has come from for my dress. PATTERN: as the base for my ‘Artist’ dress, I used a mix of 3 patterns: Simplicity 3827, year 2007, view B, for most of the dress; Simplicity 4365, year 2005, view B, for the godets added into the bottom dress seams; Simplicity 3092, year 1949, view 1, for the scalloped collar. I drew my own pattern for the white trim design…I’ll explain more about this down lower. TIME TO COMPLETE: I spent at least 25 hours (counting sewing only time) to complete my dress, all worth it in the end. THE INSIDES: fairly nice…all seams are clean finished or flat felled, except for the side seams and the inside edge of the neckline. Those two seams are double zig zagged along the edge because those spots needed to move and stretch a bit. FIRST WORN: to this photo shoot then over to my parents’ house to show this off! The main body of the dress was made using the Simplicity3827 because it had the exact under bust shaping, six paneled skirt, and neckline as the movie dress. Only one change was made – the hem of the shorter dress was lengthened just a few inches to land upper mid-calf on myself. I must say, this is a wonderful pattern! It is designed very well, the sizing is right on, and the fitting is oh so comfy. I especially like how clean and non-bulky were the small armhole facings (for the sleeveless option). Also, my side zip in this dress turned out so well it’s nearly invisible. I already have plans to make the longer length, 3/4 sleeve version of this pattern in another fabric from my stash. I chose the godet pattern piece for view B from Simplicity 4365 (in picture at left) because this piece was longer and not as wide as the godet for D, E, and F skirts. Paying close attention to the design of Peppy’s dress, the godet points on my dress end/start right at the spot where the leg bends at the hip. Several inches had to be taken off the bottom of the godets for them to hit at this point in the seams and even up with the dress hem. Four godet pieces were cut: 2 for the front and two for the back. After doing a few of these type of godet pattern pieces, such as for my recent “Water for Elephants” 1931 dress, I feel those tricky points are done quite well, especially the inside (see pic below right). The collars were by far the most tedious and slow specialty work I have done yet to date. Adding the trim to the collars got old really quickly, mostly because I had to be so exact but also because it was hard to see any progress made to the dress…I just wanted it done! I should clarify why I’m using the plural ‘collars’. It’s because I had to make three full sized collars, with trim sewn on, to decorate the neckline of my ‘Artist’ dress. 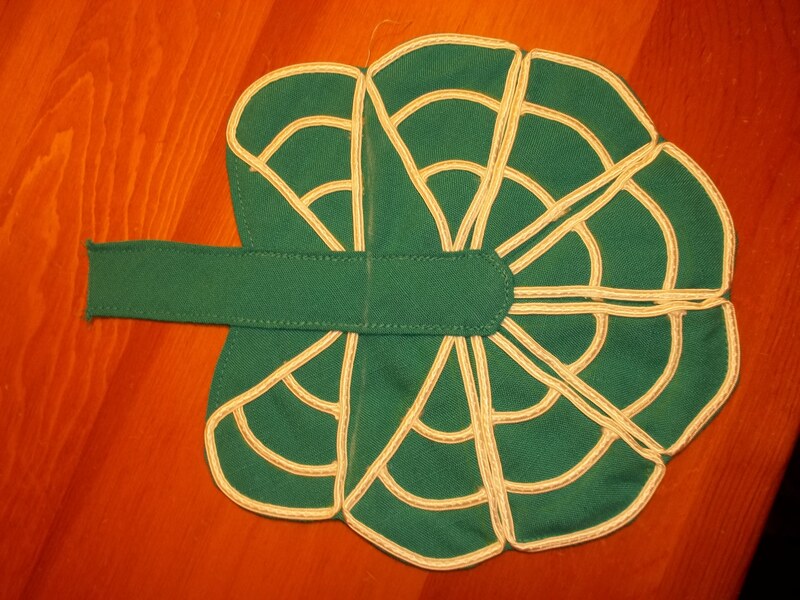 Thinking outside the box has again produced great results for my sewing. My decorative collar is based on a pattern from an old original 1949 Simplicity 3092, click here to see the Wiki page of this pattern. The one scalloped collar piece of View 1 is supposed to go around the whole neck, but that same pattern piece is the exact length from the center back of my ‘Artist’ dress to the center front of its V-neck. So I took the collar pattern from Simplicity 3092 and copied it to have a paper version that I could draw and score and mark up all I wanted. I felt like an engineer drawing out the design for the collar scallops – first I traced out the grid of some graph paper onto regular paper, then used a compass to have even arcs and even spaces between the arcs. For my design drawings to fit in curves of the collar, I had to enlarge my scalloped design on a copier to 135% bigger. 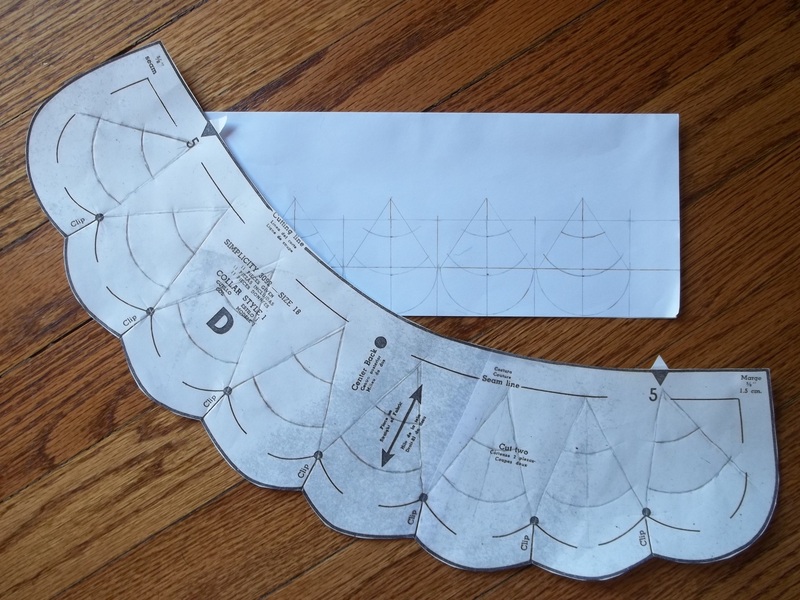 Now I was able to trace my scalloped design directly onto my copied pattern piece of the collar, making sure to keep the design from going over the seam allowances. See the picture below to get an idea of what I did to a basic collar. All the tiny triangular shaped clippings leftover from shaping the scalloped collar edge are all saved, kept in a clean baby food container, and I hope to make my own lace with them. The current edition of Threads magazine #169 has a tutorial on how to make your own lace using fabric scraps, thread, and wash away stabilizer. I love to find creative ways to use leftovers from other projects! My mind ruminated over several different ways to add the scalloped design to the collar, but anything that involved hand-stitching was gladly eliminated, and, as it turns out, the president braid I used worked great…I hope it washes well too! 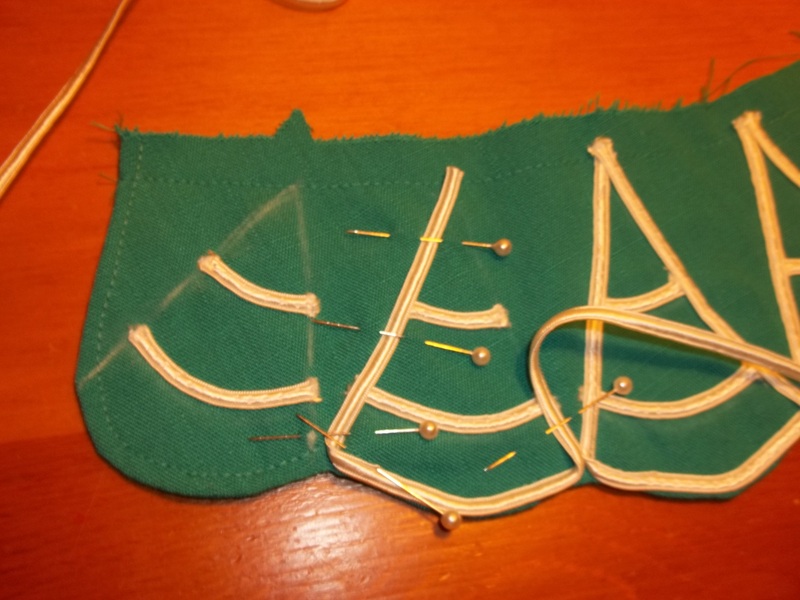 I used my sewing machine to add the white braid trim and held the pieces in place with extra long pins while I worked. EACH collar took me FOUR HOURS of work, from the cutting to all the trim sewn on. Believe it or not, each collar also used up 3 5/8 yards of trim. I could only sew on the collar in 1 1/2 hour intervals – it was all that my shoulders, hands, and patience could stand in one dose. The center front fan is simply one of the three collars, for which I folded the scallops together and sewed from behind to pinch out the excess plain fabric. It was hard and frustrating to sew from the wrong side, along the trim, but not catch the trim. The center of the scalloped fan is covered with a rounded end casing to cover up any messiness and give me a nice flat center spot to sew the front buttons down. After trying my scalloped fan on my ‘Artist’ dress, I ultimately decided to cut the extra end trim off (you can see my cutting line of chalk in the picture) and shorten it so it wouldn’t be so overwhelming and cover up the front bodice as much. By the way, the buttons I used are small, with a pearlized textured top – these were fished from my stash by hubby, and are most probably vintage originals. I did hit a bit of a problem after doing the trim on two collars. I ran out of white braid! I called all over and no one was helpful over the phone, so I went out myself, and found some more to finish. Whew! 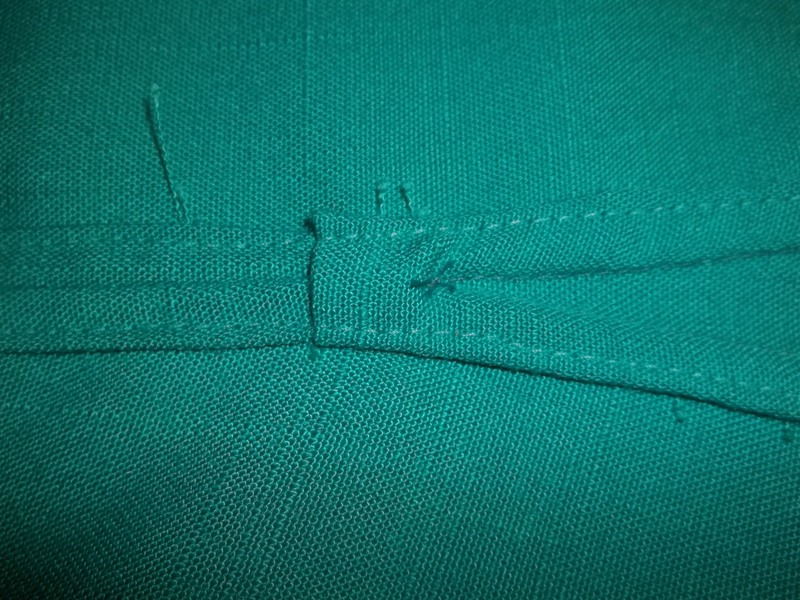 My long right and left collars were sewn down to the neckline just at/below the dress’ facing, with the white braid ends tucked under so there are no raw edges showing. I couldn’t really pick a color to use for top-stitching down the collar, so I used clear filament thread…nearly invisible and so non-historical, but don’t tell anybody because it worked out great anyway. 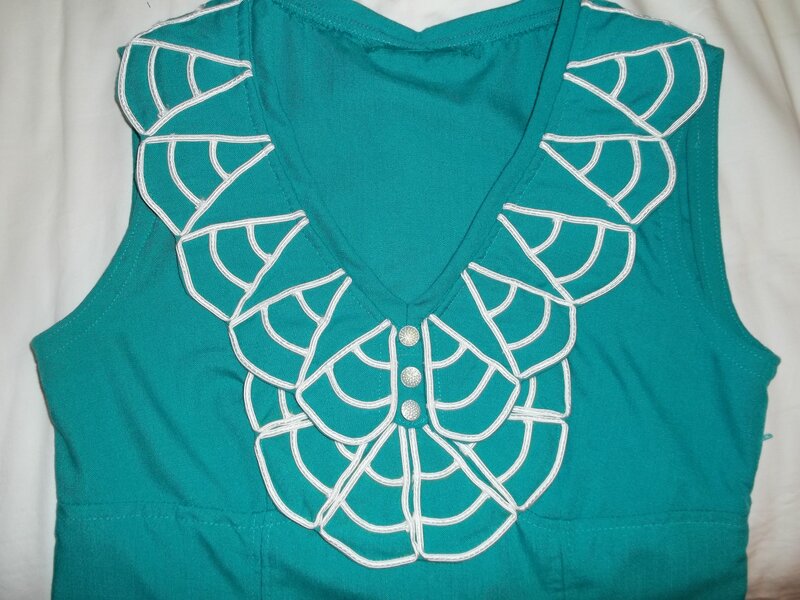 The collars matched together perfectly in the front as well as the back, as you can see from my picture. I’m showing off my tap shoes in this picture! 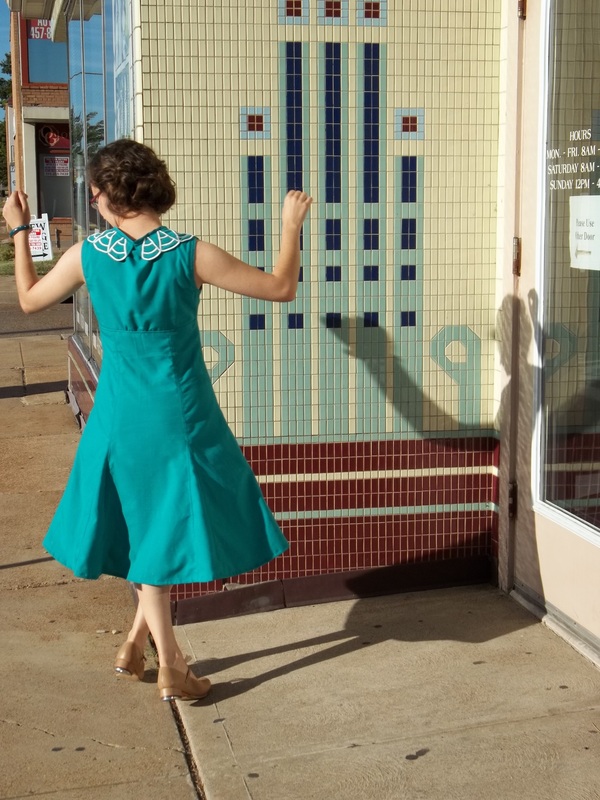 We had the perfect era-worthy backdrop for the photo shoot of my ‘Artist’ dress. The Deco designed tiled wall you see in the background is only a number of blocks away from where we live, and it is covered in decorative work from top to bottom -so pretty! The entrance wall in our pictures is by far the best part of the building, I think. I wish new buildings were made this beautiful but I guess that’s what makes these old buildings special. I really enjoy my ‘Artist’ imitation dress – it’s a very different 30’s style. This project was one of the few that totally surprised both me and hubby because we really couldn’t see it coming together until it was together. Then we realized what I did. I feel so good about this dress that I have everything on hand to make at least two more imitation outfits of Peppy from “The Artist” movie. Keep on the lookout for them to appear in my blog this winter. 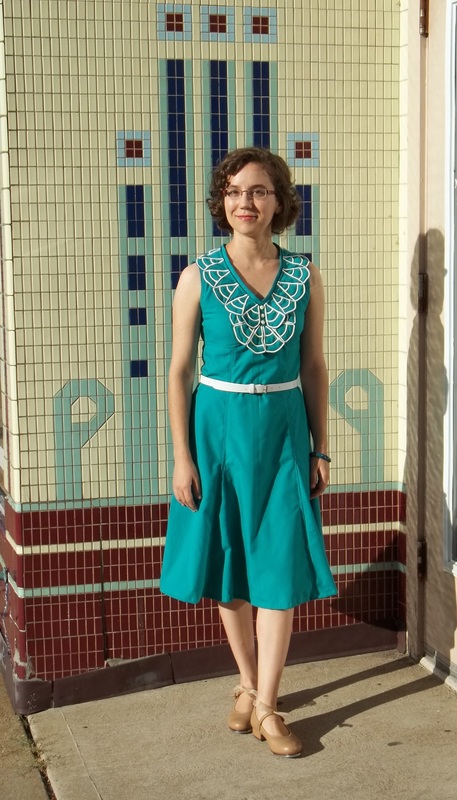 If you haven’t seen the movie “The Artist” for yourself, please do; if you’ve seen it already I hope you enjoyed it and recognize my dress. 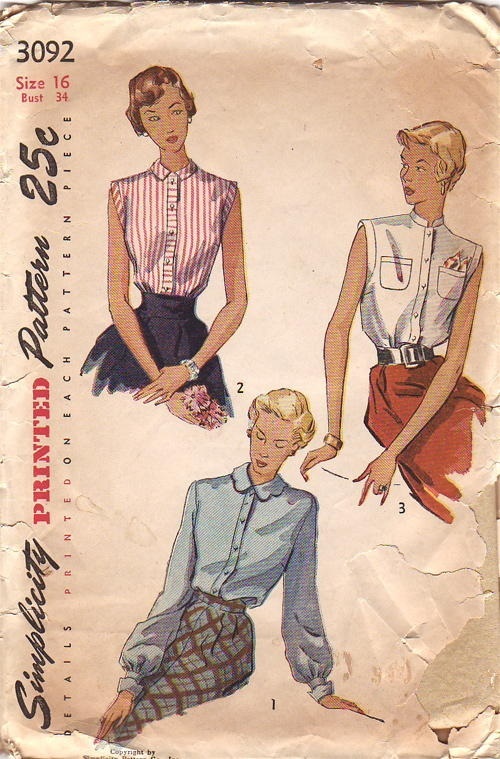 This entry was posted in 1930s and tagged "Simplicity pattern", 1930's, collar, Copycat Challenge 2, dress, godet, linen look, movie look-alike, Peppy Miller, scalloped collar, Simplicity 3092, Simplicity 3827, Simplicity 4365, The Artist, turquoise by kellycb. Bookmark the permalink. Fantastic dress!!! Great job on details!!! Thank you for doing this dress and post. You did a great job! 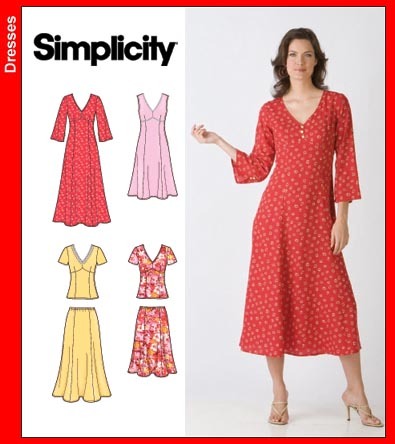 I had been searching for photos of Simplicity 3827 made up. Of the few photos I found, most of them were nowhere near my body shape or size. Seeing your photos finally let me see how it would look on someone who had a similar shape and size. The pattern photos are often not very realistic for most body shapes. All of the details you posted also gave me an idea for another fabric option. The gathering in the bodice center back told me I could not use anything with too much body, so there went the cotton batiks that are semi stiff. It was either go with something drapier, or change that gathering to the classic darts further away from the center back. Not a big deal, but more work. Thank you for showing the back view, as well as a view without the belt. You even showed a length I will probably make for myself. … It is always fun to see someone combine several different ideas together. If I ever consider making this dress for dancing, I will consider adding godets as well. They just look wonderful when you sway and move when dancing! I hope you wear your dress dancing, and treasure every moment while doing so. Your welcome, and thank you for your comment! I’m glad this post was helpful. I do like to show as many views and details as I feel someone else would need to make their own version, too, in my posts. Cover drawings are terribly deceptive many times (why do they have to draw women as toothpick bodies with overlong legs? ), and line drawings can be too basic. I haven’t worn it dancing yet – I really should, like you said, because when I wear this I do a lot of twirling! Happy sewing! 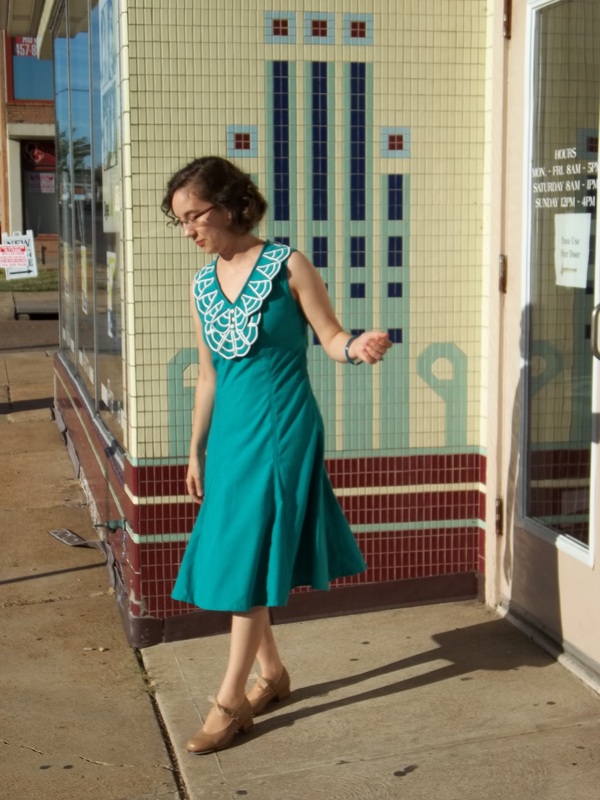 I do hope you love your version of this dress pattern as much as I love mine!